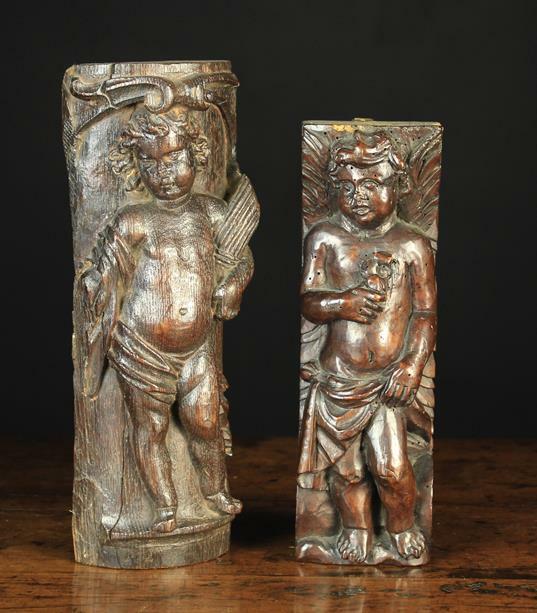 Two 17th Century Ornamental Pilaster Figures carved in relief with delightful cherubs; one on a split column holding a wheat sheaf 11¾ ins x 4 ins (30 cm x 10 cm), the other with feathered wings holding a flower 10½ ins x 3¼ ins (27 cm x 8 cm). 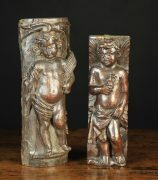 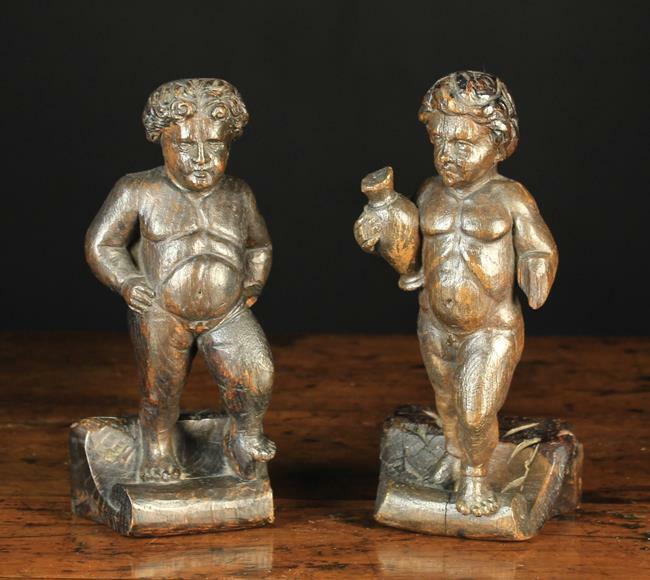 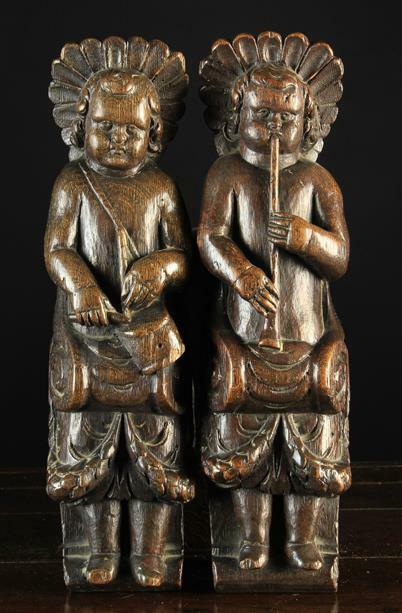 A Pair of 17th Century Wood Carvings of Putti; The curly haired infants depicted standing on scrolled bases; one holding an urn, 9 ins (23 cm) in height. 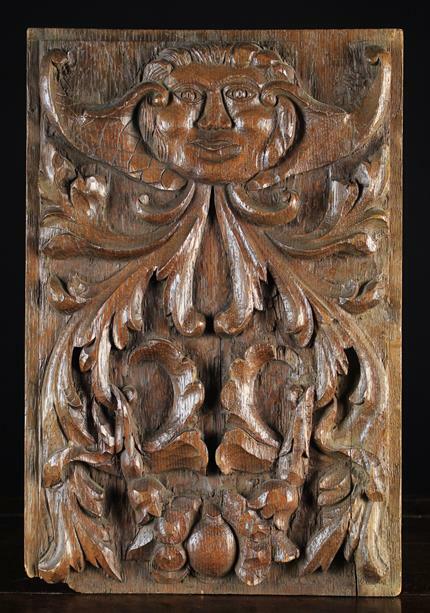 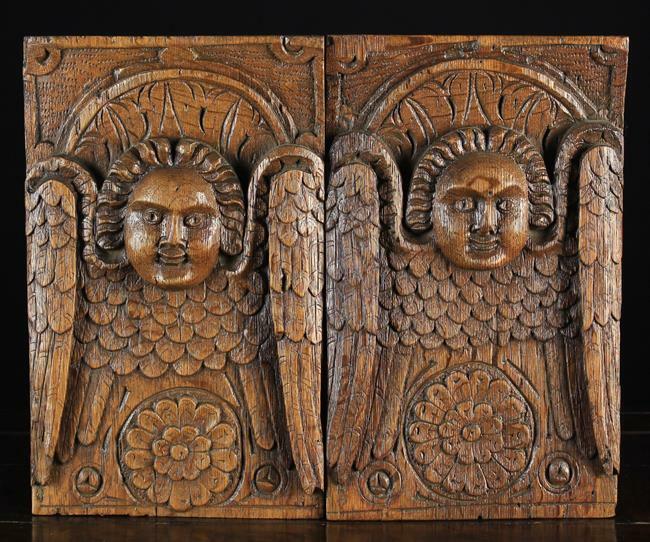 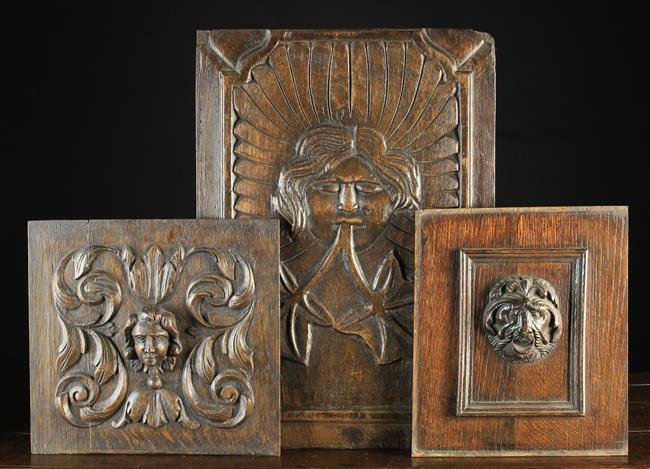 A Pair of Late 17th/Early 18th Century Oak Panels, each carved with a haloed angel head with feathered wings above a flower head roundel, 12 ins x 7 ins (30 cm x 18 cm). 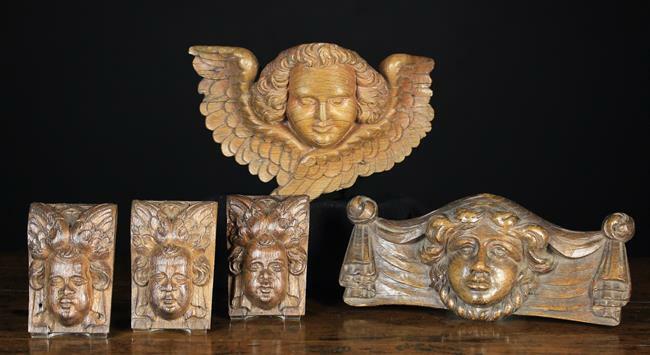 A Group of Ornamental Carved Wooden Face Masks: A set of three small 17th century appliqués emblazoned with winged cherub heads 5 ins x 3¼ ins (13 cm x 8 cm). 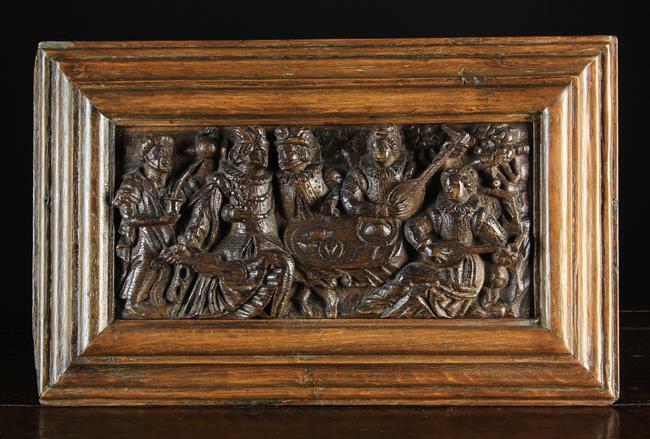 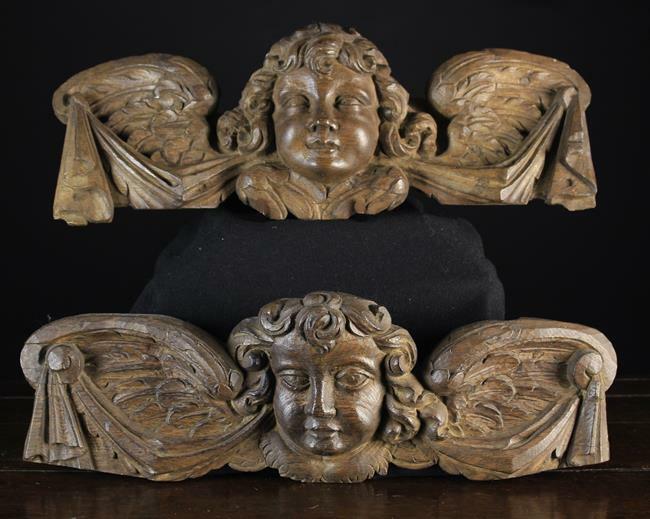 An 18th century relief carved wall mount in the form of a cherub's head above feathery wings. 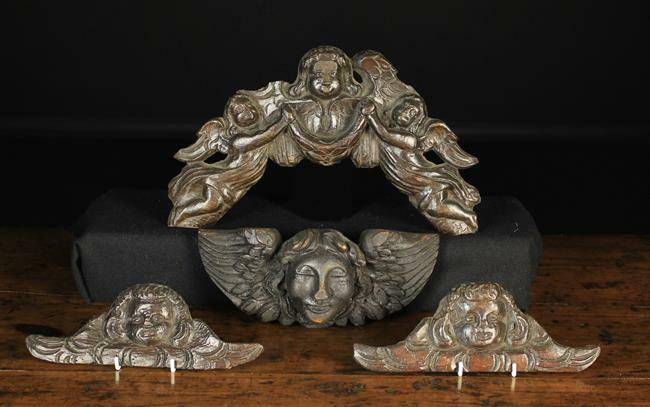 And a 19th century face mask swagged in drapery, 5¼ ins x 11¾ ins (13.5 cm x 30 cm). 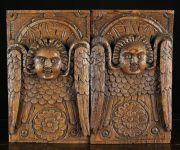 A Similar Pair of 18th Century Relief carved Appliqués/Wall Mounts in the form of curly haired cherub heads flanked by feathery wings festooned with drapery, 6½ ins (16.5 cm) high, 20½ ins (52 cm) wide.